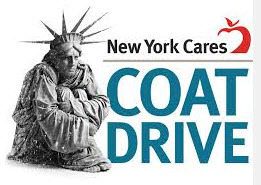 Help keep all New Yorkers warm this winder by donating winter coats at 300 locations citywide or by starting your own coat collection team. Drop your winter coats at one of our 300 public collection sites citywide now through December 31st. You’ll be guaranteed to find one close to your home or office. Search using our interactive map. Is your company or department passionate about helping members of the community? Is your church group or alumni group looking to bring people together and make a positive difference at the same time? For more info on how to create a collection team click here.